We’d love your help. Let us know what’s wrong with this preview of The Broadview Anthology of Social and Political Thought by Samantha Brennan. This volume features a careful selection of major works in political and social philosophy from ancient times through to the present. Every reading has been painstakingly annotated, and each figure is given a substantial introduction highlighting his or her major contribution to the tradition. 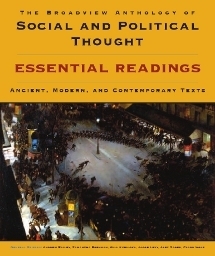 The anthology offers both depth and breadth in its selection of material by cent This volume features a careful selection of major works in political and social philosophy from ancient times through to the present. Every reading has been painstakingly annotated, and each figure is given a substantial introduction highlighting his or her major contribution to the tradition. The anthology offers both depth and breadth in its selection of material by central figures, while also representing other currents of political thought. Thirty-two authors are represented, including fourteen from the 20th century. The editors have made every effort to include translations that are both readable and reliable. To ask other readers questions about The Broadview Anthology of Social and Political Thought, please sign up.